Coming back for our 31st year! The Taste of Coeur d’Alene has become one of the Inland Northwest’s favorite festivals. Coeur d’Alene City Park on beautiful Lake Coeur d’Alene in the summer is the ideal location for this event, attracting more than 80,000 seasonal and year-round residents and tourists, over three days. The festival’s fine art and crafts are showcased al fresco. The festival also features live professional music and a variety of quality foods and beverages including a beer garden featuring local micro brews. Admission to the festival is free to the public. 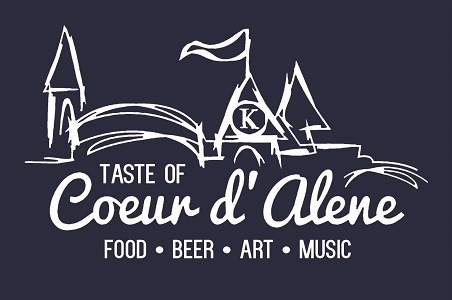 We expect the 2018 Taste of Coeur d Alene to be the best ever! Please register here if you would like to have a "Vendor"/"Artisan" booth at the 2018 Taste, or email us at tasteofcda@panhandlekiwanis.org for more information. Booth Exhibitors may not use or display their items for sale on space outside their booth without paying applicable additional fees. Fee (Art/Craft, Food Application Fee): $25.00 See booth fees below on this application. You can submit up to 2 applications for this show. This is a "juried" show. Your application does not mean an automatic entry to the show. Each application will be evaluated for uniqueness; quality; and presentation. Final selections shall be at the sole discretion of the Taste of Coeur d'Alene Event Committee.